So many people think eating keto is expensive, but that just isn’t the case. 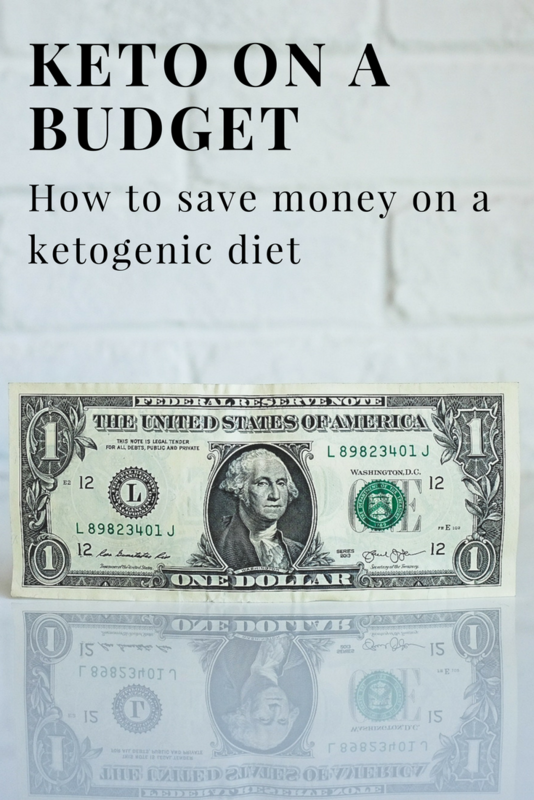 You can definitely eat keto on a budget! I’m like you, I have a mortgage, student loans, I want to save for retirement, but that doesn’t stop me from eating keto. It’s better if you’re eating higher-quality fats and meats, but if you can’t conventional fats and meats are still a better option than the Standard American diet (SAD). Coconut oil has a shelf life of around two years, so buying in bulk will help you save a lot of money compared to buying smaller containers whenever you run out. Try to buy ones in glass container;, if you can’t find any in glass containers, transfer your coconut oil into glass containers like mason jars when you get home. This way you make sure that your fats won’t absorb any plastic even if the plastic is already BPA-free. Also, store your fats in a cool dark place to extend their shelf life and make them less likely to go rancid. I do the same with EVOO and Avocado Oil. I buy most of my nuts at Sam’s, BJ’s, and Costco to save money. I don’t have memberships to all three of these places, but I split a Sam’s Club membership with my parents, my best friend has a membership to BJ’s, and my Aunt has one to Costco. By having friends and family with all different memberships I’m able to find the best deals for the best quality products. BJ’s by far has the most organic fruits and vegetables, as well as higher quality meat. Sam’s and Costco on the other hand have the biggest variety of foods. I normally take one day per month to stock up on all of the foods I can buy in bulk and make it into a girls day. I get most of my non-starchy vegetables at the local farmer’s markets. I do this because I live in a rural area so there are a lot of farms; many of the farms aren’t certified USDA organic, but they’re grown organically. This way, I’m able to get organically grown vegetables for just a little bit higher than conventional and sometimes even cheaper than conventional vegetables at a grocery store, and for a lot cheaper than organic vegetables at a grocery store. Another option is to get organic fruits and vegetables that are frozen or conventional fruits and vegetables that are frozen. Make sure that the ones you are buying don’t contain any added preservatives, sweeteners, or color enhancers. The ingredients list should just read one item, and that should be whatever fruit or vegetable you are buying. Another option to get good quality meat is to go in with friends or family and buy half of a cow, pig, or lamb. I do this every year. Again, I live in a rural area so I’m getting grass-fed organic beef or pasture-raised pig for the price of conventional meats if you were to buy at the grocery store. For grass-fed cow, the last time I bought one it came out to about $6.40 per pound. So that means I get grass-fed ribeye, porter house, T-bones steaks, as well as ground beef for $6.40/lb. You will definitely save money on steaks and higher quality cuts of meat by going this route! Do you live by the water? I live by the ocean, and I’m very fortunate we have local markets where we can buy fresh-caught seafood (that day). By shopping at local seafood markets, I’m able to get a better quality product and at a cheaper price than by shopping at Publix, Winn Dixie, or Whole Foods. You can normally buy fresh eggs at your local farmer’s market also! That’s my last resort because I normally get farm fresh chicken and duck eggs from my hairdresser for $4 a dozen or a dozen-and-a-half depending on how many other people have purchased from her. She lives out in farm land area and has a little bit of everything. You can’t beat farm fresh eggs! Farm fresh eggs taste way better than any store-bought cage free organic eggs and cost a lot less! Have you noticed when fruit and vegetables grown in your local area go out of season that they tend to double or triple in price? Living in Florida, berries, avocados, and oranges are our main fruit crops and the prices fluctuate drastically depending on the seasons. When they’re in season I can find strawberries as low as $0.75 per pint and out of season their price goes up to $3.99. The same goes with other fruits and vegetables too. A way to save money could be to stock up on fruit and vegetables when they are in season and either freeze or can them so you can enjoy them in later months but not have to pay the higher prices. If you live close to a bunch of different grocery stores it never hurts to look at their sales fliers. When Publix Greenwise chicken goes BOGOF I stock up on it and put it in my deep freezer. The same with their Greenwise beef ribs. Also, Aldis can be either a hit or miss. Sometimes I can find a pack of four organic avocados for $3.75, organic lettuce for super cheap, as well as peppers, cucumbers, and onions. They also have a grass-fed organic ground beef that I’ve gotten before whenever we’ve run out. Since a ketogenic diet is high fat, around 70 to 80 percent and fat has more than two times the calories than protein and carbohydrates you’ll actually be saving money by eating keto because you won’t be eating as much protein or carbohydrates. You’ll definitely be cutting out most of the processed foods in your diet. Frequently processed foods are more expensive because they are convenient to have on hand and require little prep or cooking skills. Depending on your cooking skills, eating a Ketogenic diet may seem a little daunting at first, but that’s nothing a little practice can’t overcome! Speaking of cooking skills, we just launched a Summer Entertaining e-book with super easy and satisfying recipes that the entire family will enjoy! And best of all, all of the recipes are keto-friendly! Click here to get your copy. Good ideas, but maybe remember that when most people think *Budget* they aren’t imagining $4.00 cartons of eggs or being able to afford a whole cow.